In 1935, the notion that film should be considered an art form, something to be preserved in the same way books and paintings are, was still quite revolutionary. The BFI National Archive was one of the first film archives to be established; film appreciation was already being nurtured in this country by groups such as the Film Society , who organised screenings of foreign and non-commercial films and helping to alter perceptions of the medium's artistic potential. In fact, the Society's collection of prints was one of the most important donations to the BFI's Film Library (as it was then called) and, for a few classic titles, represented the only surviving original material. Thanks to this, Britain is lucky that so much of our film heritage is intact. The Archive has been preserving British cinema since 1935 and no major works by our most respected directors have gone astray since then. While this means we have an excellent overview of our national cinema, there are still gaps in our knowledge and in the Archive's collection which the BFI has long wanted to fill. In 1992, it launched a campaign called 'Missing Believed Lost', putting out a call to archives and collectors round the world to check their holdings in search of elusive British films. A book was published which listed the titles, with stills and reviews. The list began in the silent era and ended with the 1945 film Flight from Folly , a vehicle for stage star Pat Kirkwood . The hunt turned up fifteen of the 100 titles, including one Michael Powell quota quickie, His Lordship (1932), three Walter Forde comedies ( Bed and Breakfast , 1930; The Ghost Train , 1931; Condemned to Death , 1932) and the much sought after silent film The Constant Nymph (d. Adrian Brunel, 1928). Not all of the discoveries were of complete prints - only 100 feet (or just over a minute) of the Max Miller comedy Thank Evans was found in a batch of nitrate from a donor in Carshalton, while 220 feet (just under two and a half minutes) of Chili Bouchier in Gypsy turned up at the NFSA in Australia. Some of the films are dubbed or subtitled: Condemned to Death is a cut version dubbed into French, the print of Bella Donna (d. Robert Milton, 1934) which turned up at the Czech archive, has Czech subtitles, and the print of Secret Lives (d. Edmond T. Gréville, 1937) has German and French subtitles and occasional explanatory intertitles, replacing the English originals. Despite these issues, having some material on a title, no matter what its condition, length or language, is obviously better than having nothing. Some of the 'finds' are covered here, along with Helen of Four Gates (d. Cecil M. Hepworth, 1920), which, although not part of the original 'Missing Believed Lost' project, is a valuable recent addition to the collection of the BFI National Archive. But how does a film go missing in the first place? There are various reasons: laboratory fires, bankrupt production companies or simply because no one thought they were worth keeping. Occasionally, more malicious destruction has been carried out by studios who purchase a property and want to get rid of previous versions, as MGM tried to do to the original British version of Gaslight (d. Thorold Dickinson, 1940). When sound film production took off, silent film was considered dead and many early nitrate prints were melted down to extract their silver content. Back in 1929, who could have predicted that audiences eighty years on would still be filling cinemas and even concert halls to watch silent films with orchestral accompaniment? 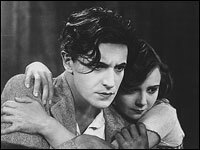 In 2010, to mark the Archive's 75th anniversary, a new initiative entitled 'BFI Most Wanted' was launched, in which 75 'lost' British films were highlighted via a website that attempted to reconstruct each title from contemporary reviews and descriptions, scripts, stills, pressbooks and other materials. While 'Missing Believed Lost' focused on silents and 1930s titles, the new incarnation spans from 1913 to 1983, demonstrating that it's not only early films which can slip out of view. The hope is that some of them may turn up in private collections, foreign archives or film labs, while house clearances and the demolition of cinemas and bingo halls can reveal forgotten cans of film. Important rediscoveries are being made to this day. In the 1990s, the original negatives of the pioneering Mitchell & Kenyon company (shot nearly a century earlier) were found in the cellar of a building facing demolition. Much more recently, a substantial chunk of long-believed-lost footage from Fritz Lang 's pioneering sci-fi classic Metropolis (Germany, 1926) turned up in South America, and a missing feature by John Ford , Upstream (US, 1927) was found in New Zealand. So while many of the films in the 'Missing Believed Lost' and 'BFI Most Wanted' initiatives may indeed be lost forever, recent experiences suggest that we should never completely abandon hope. Who knows, even Hitchcock's The Mountain Eagle (1925), which for decades has been the holy grail of British lost films, may take wing once again.